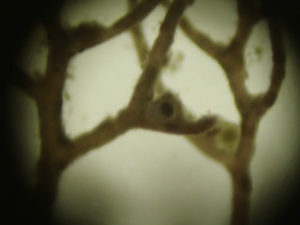 The red alga Bostrychia scorpioides occurs all around Britain and Ireland (Maggs and Hommersand, 1993), It lives at the top of the shore, primarily in estuaries, where it grows in amongst saltmarsh plants but also on sheltered rocky shores, often shaded by overhanging trees. On rock, it is often found with the red alga Catanella caespitosa. Prud’homme Van Reine and Sluiman (1980) and Maggs and Hommersand (1993) reported how reproductive structures are rarely seen in Britain, with all records to date occurring in the south coast of England between 1882 and 1888 (Prud’homme Van Reine and Sluiman, 1980). Studies of B. scorpioides in culture by Prud’homme Van Reine and Sluiman (1980) suggestthat prolonged high summer temperatures are required for the formation of tetrasporangial stichidia. Of the hundreds of samples of Bostrychia scorpioides examined by Prud’homme Van Reine and Sluiman (1980) only four bore cystocarps and these were on specimens collected at Portland and Weymouth between 1884 and 1888. Since then there have been no published records from Britain and Ireland. 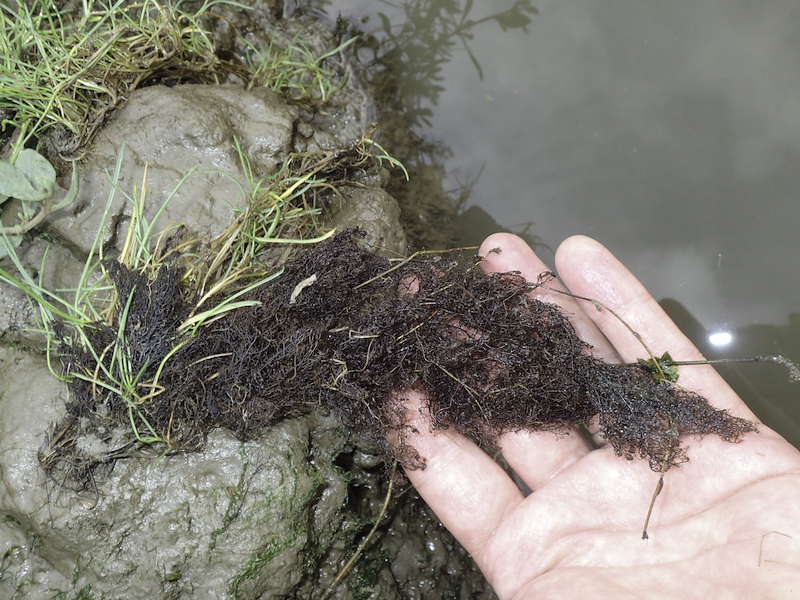 A plant was found with cystocarps in various stages of development at Lawrenny Quay in the Milford Haven Waterway, West Wales. The find was made in September 2015 while un-dertaking rocky shore monitoring in the Pembrokeshire Marine SAC for Natural Resources Wales. The site is west-facing rock, in the mid-section of the Daucleddau estuary and is fairly well shaded by oak woodland backing the shore.